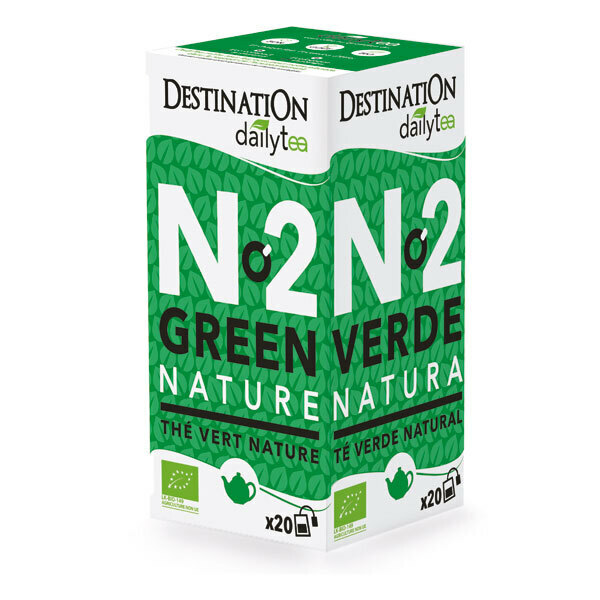 A delicate and light tea which naturally promotes digestion. Box of 20 teabags. This Ceylan Green Tea is unfermented, light in caffeine and naturally promotes digestion. - Best before date: Use within 36 months. Destination is the expert in all things tea, coffee, cocoa, and sugar. The company, which now has a team of 50 staff, aims at providing high-quality organic products and sharing its passion for flavour. Destination works directly with local farmers, growers, and food producers all around the world in order to select the best raw materials and promote sustainable practices. Destination offers a wide range of organic products which are GMO-free and do not contain any chemical additives, flavour enhancers, colourings or preservatives. The company is FLO certified (Fairtrade International) and the Max Havelaar logo appears on many products’ packaging. They also participate in the development of sustainable agriculture as well as being conscious about the amount and type of packaging they use.